EarthSense Soap Gift Basket Giveaway! Welcome to the Green Your Summer Event! The Blogging Mamas Network has come together with like-minded bloggers to make sure your grass isn’t all that is green this Summer! If you’re a Green Mama here’s your chance to Green Your Summer! I’ve teamed up with other bloggers to bring you LOTS of chances to find great Eco-friendly products to help you go green! So be sure to hop around to all the other giveaways at the bottom of this post before the event ends on June 13! 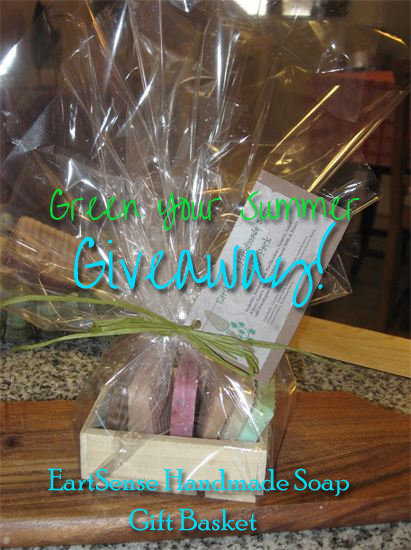 Here on rays of bliss I am giving you a chance to Green up your Summer with a EarthSense Handmade Soap Gift Basket! Baskets include 2 full size bars of soap and a 8oz jar of 100% dead sea bath salts in a cute basket wrapped in cellophane and a big bow. EarthSense Soap is a small business, I personally know Cindy, the lovely women behind these wonderful and natural soaps. She uses only the most natural ingredients available. They lather well and smell great. Only naturally good for your skin ingredients are used; ingredients such as, coconut oil, palm kernel oil and canola oil, essential oil and or fragrance oil. Other ingredients may include: goat’s milk, buttermilk, organic oatmeal, cornmeal, coconut flakes, cocoa, flax seed, calendula petals, lavender buds and other botanicals and/or herbs. Bath salts are made from 100% Natural Dead Sea Salt and essential oils with no added ingredients or fillers. Here are some of the soaps offered: Almond Flax seed, Banana Coconut, Cafe’ Latte, Eucalyptus Peppermint, Mandarin Mint, Organic Oatmeal, Milk and Honey. EarthSense Soap products are safe for the entire family! The giveaway will end at 11:59 pm EST on Sunday, June 13th. While you’re hopping, be sure to enter the TWO Grand Prizes for to Green Your Summer for Mom and Baby! You’ll find prizes including a Lunette Menstrual Cup, Amber Necklace and Bracelet Set, a Merino Wool Sleepsack, re-usable Snack Pouches, and earth-friendly Vinyl Wall Decals from Walls Need Love! According to Jenny, So Easy Being Green, the Blogging Mamas Network, and the Green Your Summer participating bloggers are not responsible for sponsors who do not fulfill prize obligations. I really want to try composting this summer-especially with all the extra veggies from the garden! We’re going to grow a little garden on our deck. Recycle more of my stuff! Another awesome blog hop giveaway with so many cool blogs participating. Thanks for a great prize offering. We’re recycling more stuff at our house and figuring out how to repurpose items. Recycle. We try to visit a farmers market and buy local produce. This is a wonderful giveaway. Thanks for sharing! we always ditch the car and walk everywhere in summer. I have the double stroller fully loaded for walking miles each day. I’m trying to break my water bottle addiction and recycle my collectin of old papers from school. I am greening my summer by making my own laundry detergent, cleaning products & insect repellents. We are growing an organic garden 🙂 We always try to follow green living tips. We recycle and go to the farmers market. Don’t know what happened. But it looks like they are working now! Thanks for letting me know. I will ride my bike instead of walking. Thanks, I got this problem fixed. Thanks again for letting me know. We do have some solar panels but plan on putting in a wind turbine and more solar panels. We also grow a lot of produce in the garden. We we recycle and grow a garden. We recycle everything we can. We also joined our utility company’s energy conservation program and have stopped watering our lawns as much. I ONLY run full dishwasher and clothes washer loads. I will use less paper goods. I will conserve water this summer. We will continue to use cloth diapers and dry them outside on nice days instead of using the dryer. i am going to try a new recipe for homemade stain remover and for homemade laundry soap. i already recycle as much as possible, compost, upcycle, etc. thanks for such a great giveaway-i love handmade soaps! Pick up plastic bags that people set free everywhere I walk. I’ll recycle all the cans of coke we’ll be having this summer! We recycle and I love to upcycle old items. Also growing an organic veggie garden. Using less chemicals around the yard. Recycling in our new composter, growing our some of our own veggies and herbs and always bringing our own reusable bags to the stores when shopping. Thanks for stopping by my blog. Let me know how your boy’s like the salmon patties. I will green my summer by using my bike for transportation whenever possible instead of driving the car. Recycling and eating from my organic garden. I’m planning to add more solar panels to my house so I consume less electricity. We’re recycling more, repurposing what we can and freecycling what we no longer have a use for!